Born and raised in Minnesota, Jeff has served in churches in Minnesota, Ohio, Oregon, and California. A graduate of Crown College (Minn.) and George Fox Evangelical Seminary (Ore.), he's also done additional PhD studies in New Testament at Fuller Theological Seminary (Calif.). He's also a graduate of the College of Prayer (Ohio). He recently served on the faculty and was Academic Dean of the Horizon Institute in Los Angeles, a small Christian college that serves the immigrant church and community, in the heart of Los Angeles. In July 2015, Jeff returned to the pastorate and now serves as the pastor of Big Trees Community Bible Church in Arnold, California. Malou grew up in the city of Manila with four brothers and four sisters. There she graduated from Adamson University with a Bachelor of Science degree in industrial engineering. 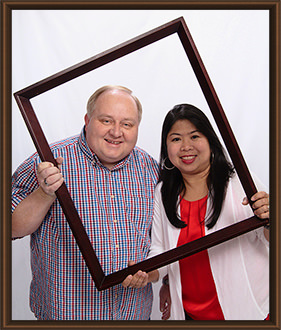 She got involved with Philippines Campus Crusade for Christ while at Adamson. After graduating, she decided to join PCCC as a missionary. She spent fifteen years in a wide variety of ministry roles at various locations until she moved to the US to get married to Jeff.